Had enough shotguns yet? So far in 2016, I’ve covered the Dagger SAP6, Adler A-110, Stoeger M3500, Beretta 1301 Competition, Benelli M4, and Mossberg Maverick HS12. How about more? Today, I’m going over the Pardus SL semi automatic 12 gauge. It’s a 3″ chambered, tube magazine 12 gauge from Turkey. Note that while this is a Pardus branded shotgun, many of the Turkish shotguns share basic platforms. The toughest thing about researching this shotgun was the near complete lack of in depth reviews online. When a local sporting goods store started clearing them out at 50% off, I couldn’t help myself and bought the Pardus SL. Note: this review is going to be ongoing. I’m starting off with just unboxing the shotgun and am going to add details as I go. I had 2 shotguns that I used as the basis for this review. 3 chokes: modified, improved cylinder, and full. Come in a little choke case with choke wrench. The safety is plastic, to the rear of the trigger guard, and functioned as every other cross-bolt safety out there. The bolt release button was on the right hand side like most others out there and it’d be a good candidate for replacing with an extended bolt release paddle if you’re intending on using this shotgun for 3 gun. The cartridge drop lever is oddly on the left hand side of the front of the trigger guard. Most of the time, these are located in the shell latch or on the right hand side of the action. It’s still accessible, but you need to remove your firing hand completely to hit it. The front sight pin is made of orange plastic that attempts to resemble a fiber optic sight, but is not. It still does the trick. Inserting shells into the magazine tube is a bit handier on this shotgun because of the partially recessed shell carrier. It makes a hole for slamming shells into and it doesn’t make for much resistance to push the carrier in. The latch and machining on the inside of the port going into the magazine tube was fine on one shotgun and a bit rough on the other, making inserting shells a bit tough. Reliability out of the box was pretty darned good. Many semi automatic shotguns require a breaking in period using 3″ magnum shotshells to work in the action before they can be expected to work with target loads. Both of the Pardus SL’s that I used had no issues running handicap target loads right out of the box. I had 1 failure to feed out of about 300 shells. I found that 3″ shells beat up the action a bit. That may be because it’s new and needs to be worked in, but the bolt really made a mess of some of the aluminum at the rear of the receiver. That, and the speed and distance that the 3″ shells got flung out at, makes me think that 3″ shells are a bit hard on the gun. It doesn’t have much of a bleed off for excess gas, so the extra pressure curve of 3″ shells really adds to action cycling intensity. The gas system also doesn’t really self clean as well as better gas system designs out there, so you’ll need to keep up with maintenance. Corners aren’t nice and sharp on the gas piston, so self-cleaning doesn’t really happen. Thankfully, it’s very quick to remove the magazine cap, forend, and access the gas system. The charging handles on both the SL’s I had were EXTREMELY tight fitting and frustrating to remove. There’s a detent ball to keep the charging handle in there, but for whatever reason, Pardus decided to also fit the handle extremely tightly, so tight I had to use tools to remove it. When I reinstalled it to go shooting, I thought I had inserted it all the way, but in fact it wasn’t in the detent, so I had some comical slow motion video of it flying off while shooting. I manually polished and sanded the handle to better fit the bolt carrier, and now it fits properly. Still with a lot of force, but far less than the 100 lbs of force it initially needed. There are a few things that work really well for 3 gun and a few that don’t. Very cheap. I’d have no problem chucking one of these into a barrel. No serial number on the shell port, so you could bevel the loading area without fear of hitting the serial. Magazine tube is crimped, which would have to be removed to get a +1 on there. Needs to be cleaned more regularly than some other shotguns. A YouTube commenter noted how closely the action appears to the Beretta 390 action. Indeed, they are very similar (except the gas piston itself). 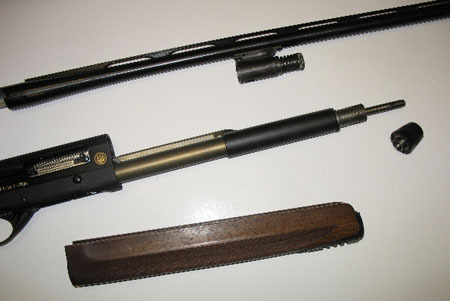 The bolt, bolt carrier, charging handle, action rod, etc, are all very similar. 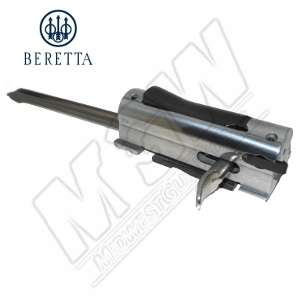 Beretta bolt, under the forend. There are parts of these shotguns that work great and some parts that aren’t so great. Fit on plastic-metal is poor, some of the machining is quite rough, and the aforementioned charging handle fit was a miss. Even with those issues, a reliable semi automatic shotgun with some rough looks is still worth $400-$500. If you step into this knowing that you may have to deal with a few fit issues, it’s not so bad. And most importantly, for the price, it’s an amazing deal.